"Although I was born and raised in the Netherlands, I lived most of my adult life in Canada. In 2002 I returned to Europe and after living a few years in the Netherlands, I moved to the UK and reside now in Bournemouth at the South West coast of Dorset. In 1960 I took some visual arts courses in ink, pencil and charcoal at the Volk University of Amsterdam, and in 1970 at the Malaspina Collage in Nanaimo at Vancouver Island, Canada. 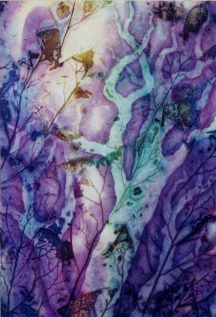 Much later in my life I became interested in painting with water colour pigments. Aside from one course in water colour techniques I took in Victoria Canada, I am self taught. At first I only painted with traditional watercolour pigments, but gradually I started painting with acrylics using these as a water colour medium. From 1994 until 2000 I had my paintings exhibited in several Galleries, solo shows and juried shows at Vancouver Island, Canada. I also had one of my Paintings exhibited at the International show "Art '95" in New York. My paintings are featured at private collections in Canada, United States, United Kingdom and the Netherlands. Although I no longer paint, I used to prefer to paint indoors at my home and draw from impressions stored in my mind"